Everyone is very focused on healing themselves, creating positive internal dialogue, loving themselves and their own spiritual advancement but one of the main magickal energies that Witches focus on is healing the earth. Can we really make a difference? How does it work? Exercise: Close your eyes and think of the world today. What comes to mind? Do you think of wars, pollution, holes in the ozone layer, wide spread cancers, poisoned water? Just imagine for one minute a new perspective. Imagine that what we see in our mind we manifest. What if the pollution, wars, etc. are being manifest by us (collectively) because somehow we have believed them to be real. Once they are real, through our manifestation, we continue to strengthen this reality by investing more power into it. Just imagine for one minute that changing the way we see the world could change the world! We have to work for this new image to make the world whole again. It’s not enough to imagine that there are no horrible things going on in the world, because there are, just as there may be illness, sadness, bad relationships and so on in our own lives. But using the principle of positive affirmations we start to manifest a new way of being for ourselves and our world. Instead of thinking things like: War is more widespread than ever! Humans have always been at war and always will be! Think: Peace is a possibility! Peace is spreading out across the world! Peace is real! Peace starts with me! Instead of thinking: The world is polluted. The oceans are dying. Think: The world is healing. The world is strong! The oceans can regenerate! People all over the world are working for clean waters. The world is alive and it is healing itself. This does not mean that you will stop all your wonderful habits such as recycling, water saving, leaving a smaller footprint and so on. We are all part of the world and the world is part of us. Just consider this: If we are part of the world and we heal ourselves, we are healing a part of the world just by our lives! In Faery tradition the sun is reflected in the earth as a star and the Underworld, which is a realm within the earth like another dimension, is the perfect reflection of the Sacred Earth. Going into the Underworld and bringing back this perfect image can change the physical world. The Star is the Soul of the Earth. We can see the Goddess Tailtu as the Earth Star (who can also be called by other Earth Goddess names such as Gaea). Imagine that you are going deep within the Sacred Earth where we find the glowing Earth Star. When we find the Star we enter into it as if it were a doorway to meet the Goddess. What will she say to you? Ask her how you can participate in healing the world. This is what she said to me on one of my visits. Tailtu Speaks: I am a Goddess. I do not need healing! But I hold all the pain and sadness (joy and love) of the world—I hold it all!—If you do world healing work it heals you, so there is less burden of pain. You may not know this but you have a chakra that connects you to the earth star. Our aura surrounds us like an egg but it doesn’t stop at our feet. It extends below us for about a foot and at the bottom of it is the earth star chakra. It is through this chakra that we connect to the earth plane at in grounds our energy body. This chakra looks like an aqua aura crystal which is clear blue colour to reflect that the earth and our bodies are mostly water. To do powerful earth healing work it is important to ground into this chakra and awaken it. In a standing position imagine that the two power centers in the soles of both your feet are opening. You might feel a warmth or tingling. Now visualize the blue crystal about 11 inches below you sitting in the bottom of your aura. Imagine that the earth star is pouring energy into this chakra. Now visualize that this energy is flowing up into your feet and up through your whole body. Be aware that you are completely connected to the earth star. You should feel solid and energized by this practice. You don’t have to be standing on the ground to do this exercise. We are like fish swimming in the ocean, always existing (swimming) in the energy field of the earth whether we are on the 2nd floor of a building or even in an airplane. This is our home! One of the ways that our energy changes us and changes the world is by influencing water. Water has the ability to change with emotions, prayers and impressions. This was displayed by the work of Japan’s Masaru Emoto. The photos have been published in a gorgeous book called The Messages of Water. 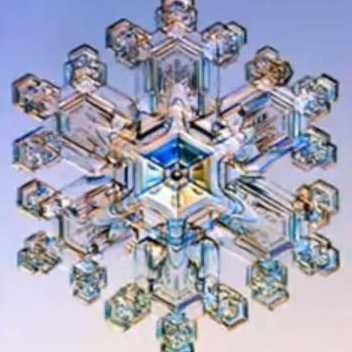 If you still doubt that your thoughts impact the world around you, viewing Emoto’s work will erase this doubt forever. By blessings water and drinking it or pouring it onto the earth we can do powerful healing. Don’t think that such a simple and easy practice will have no difference. If each person blessed water with love and then poured a little onto a plant outside this energy would spread everywhere. Don’t forget that this practice also heals you and with each healthy and spiritual person the world a change comes. Let us live in this holy place!